C. Mark Mann, D.D.S., F.A.G.D. Dr. Mann graduated from the University of Texas, Houston Dental Branch in 1988. 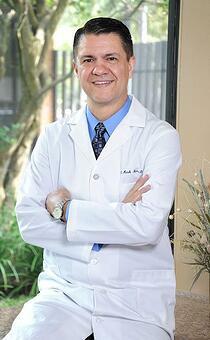 He has owned and operated his dental practice in Sugar Land since graduating from dental school. Dr. Mann lives locally in Sugar Land with his wife, three children, son-in-law and three beautiful granddaughters. His hobbies and interests include bird hunting, fishing, reading, and he serves as an elder at the Bellaire church of Christ. He also loves to study the bible, business, dentistry, and spend time with his family. Dr. Mann is a member of the American Dental Association and a Fellow of the Academy of General Dentistry. He actively pursues continuing education by attending courses, workshops and seminars. Dr. Mann loves working with people to solve their dental needs. His favorite dental procedures are porcelain laminate veneers. He says, "The incredible changes that are made to the appearance of the smile with dental veneers is incredible."